Work for AV Voice Changer Software Diamond? 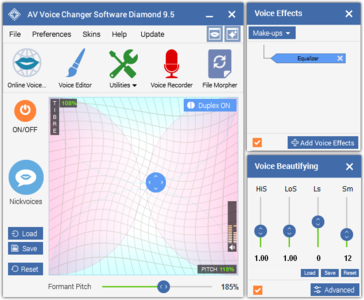 "Voice Changer Software Diamond is awesome to me"
- Easy to use as all important features I need are displayed at the main menu. - Easy to adjust the settings, change voices to voices quickly. Very useful in a real time talk. - Good effects, they also fit well for my other projects like audio messages, audio book, edit audio. - I do not need much time to get used to it and there is a whole tutorial library. - The add on store is the place to get new voice and effect packages. If you look into it, you will find many interesting things there. - Not much. But I think the software would be better if they have more tutorials for different voices and usage. I want more tutorials. - I also think they should add more Add-on packages. It is a very handy and professional software for audio projects. You can sound like anyone in real time talk, edit audio, change vocal of audio, record and create awesome audio files/audio book. And most of all, the effects are amazing. - This software helps me a lot when editing audio files for my business. - It's also good to record an audio, I can express the script the way I want in many voices, effects while cutting cost. - For personal use, it is a great tool to have fun in real time Skype chat and also fun to explore. - It has all of the functions that I need:changing my voice, recording and editing. - I am impressed with the effects. It fits perfectly for a conversation and audio message. - Easy to use, I do not need much time to get used to it. - The add on store is a great help with free download. Not much. But I think the software would be better if they have more tutorials for different voices and usage. - Sometimes I am not confident with my real voice in online conversation, so this software helps me a lot. - It is easier to make videos with different voices. Now I can do it with just my computer. - It has the functions I need, and I think you will feel the same. Instead of buying different products, this software contains everything. - The morphed voices are natural and in high quality. Very handy and professional. I would like to change the voice in already recorded audio. I realize I could play the audio and re-record it but this will cause a degradation of sound. If you need to change already existing audio look elsewhere. If however you can make due with real time changes you will be quite happy. None yet. This is still a work in progress. Hopefully in the future we can have better recording of our online meetings for future reference. Software operates smoothly, is easy to use, and a fun piece of software to use. On older devices, the software may be slow to load or respond. Some of the voice changes sound similar. I use this for fun rather than business, although YouTube would be a great environment for this. The choice of voices available makes me experiment and add some fun to my online videos and game avatars. The interface looks kind of basic but its livable. It helps me and my fellows sound more professional and grab attention in our videos where we are describing a product in the background. Great software, easy to use and helped me in a pinch!! Really nothing. Great free software and would recommend. Learning about AV Voice Changer Software Diamond? * We monitor all AV Voice Changer Software Diamond reviews to prevent fraudulent reviews and keep review quality high. We do not post reviews by company employees or direct competitors. Validated reviews require the user to submit a screenshot of the product containing their user ID, in order to verify a user is an actual user of the product. Hi there! Are you looking to implement a solution like Voice Changer?